Apply to be a disseminator if you have developed a successful teaching idea or project that you want to share with other educators. Be featured in the next Ideas with IMPACT Catalog published in the fall. Teachers selected as Disseminators receive honorariums/stipends of $750. Scroll down to complete the application. All Miami-Dade County Public Schools' educators working with students in any subject area. Applications accepted for K-12 projects in all subject areas. Special Categories: STEM projects (science, technology, engineering, mathematics) that incorporate a mobile device (BYOD) such as an iPhone, smartphone, iPad or tablet into the project; Holocaust studies; robotics; financial literacy; and civics. The application below must be received by Friday, May 10, 2019. Ideas with IMPACT assists teachers in marketing their ideas to other teachers. Disseminators are honored at events attended by leaders from the educational and business communities. Teachers gain recognition among their colleagues and the community. Disseminators receive training in presentation skills and networking strategies. Click here to download the application questions for WORD. NOTE: All questions must be completed for consideration. It is recommended that you write your proposal in a Word document or in another format that can be saved. Then cut and paste your text into the online form below. Click here to download the application in a PDF. NOTE: You can save and submit the application as a PDF (option to submit application in the PDF form). In addition, a high-resolution digital photo representing your project as well as a photo of you must be uploaded with your application. Does your Principal support this application? What is the estimated cost for a teacher to adapt the project? Please give a low- and high-end estimate. The questions below create a consistent format within which you may create a profile of your project. If you are selected, this ONE-page profile will be used as the primary copy in showcasing your idea in next year’s Ideas with IMPACT catalog. Curriculum Area(s): List one or two areas of major focus. The Project: Describe your project clearly and concisely. Start with a one-sentence description of the purpose of the project. Elaborate with examples of what students do and learn. Provide at least one detailed example of a classroom activity. Standards: List the Florida Standards your project addresses. The Students: Tell how many students participate in the project, including grade or age, level of achievement, and how often they meet. State whether or not the project can be adapted to other ages or achievement levels, and/or used with larger or smaller groups. The Staff: Give your teaching experience; mention awards and/or grants. How long have you used the project? Do you need assistants (paraprofessionals, volunteers)? Materials: Describe the setup (space, equipment) and materials needed (books, supplies). Mention materials you have prepared for teachers interested in adapting your project. Resources: Include such resources as field trips, use of school media center, public library, the Internet, contributions and loans from parents or institutions, and guest speakers. Overall Value: Write a few sentences that sell your project. Describe the project’s best features, innovative aspects and contributions to student achievement (cognitive and affective). Explain why teachers would want to adapt it for their classes. Please upload a color photograph suitable for reproduction that projects a visual statement of your project. Ideal images include a close-up photo of 1-2 students working on a project, smiling, and looking at the camera. Multiple images may be uploaded. 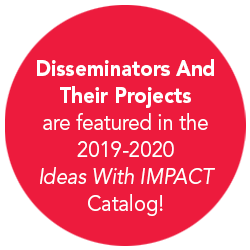 If your project is selected, both you and your project will be featured in the 2018-2019 Ideas with IMPACT catalog. Please upload a quality, high-res photo of yourself.